Ivy League universities are the most precious universities of the country. Students from not just the USA but the entire world dream of getting admission in these schools. Since these universities are so prestigious, how to get admission in one of these eight schools is something that everybody wants to know. There is a sense of mystery around how to actually accomplish this task that seems to be almost impossible. Ivy League schools seem to be the guarantee of a successful life to most of the people and rightly so. These universities are the first choice of all the students. You ask a student about his dream college and you already know that it is going to be one of the Ivy League universities. 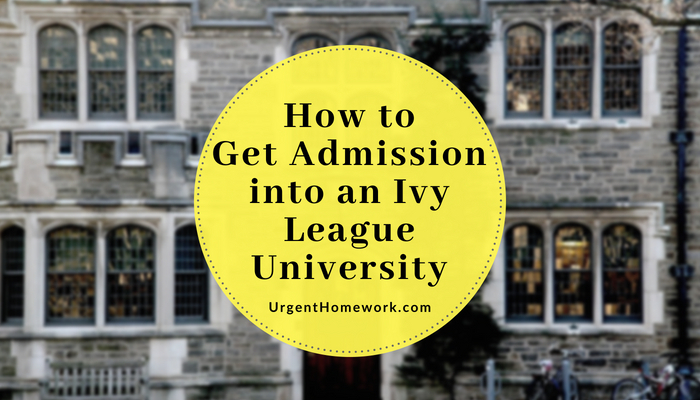 Although, we all know that hard work is the only key that can take one to these schools, still, there are some things that a student can easily do to improve his chances of getting admission in an ivy league school. You should get the idea of passion right in your head. You should be clear about what you actually want to do. The Ivy schools are not really interested in what you are doing. For all they care, it could be anything like athletics, academic clubs or anything else. What they are really interested in is why you have chosen to do those activities and what you get out of it. They are interested in the qualities that you will bring to their campus if you get the admission. They need to see qualities like leadership, discipline and teamwork in you. The Ivy Universities is interested in the students who focus on a few things that interest them the most for all the four high school years. 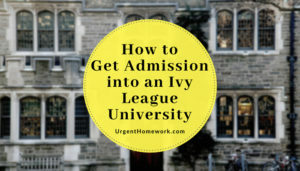 So, instead of joining any academic clubs, you need to follow your passion seriously if you really want to get admission to an Ivy League university. Well, this is something that goes without saying. You need to have a stellar record as far as your test scores and grades are concerned. These are still two of the most important factor. Your test scores and grades will have a serious influence on your application. Unless you have some other achievement that helps you stand out among the applicants, you need to have great test grades. Moreover, course rigour is important too. These universities look for students who keep challenging themselves and keep on succeeding. 3. When it comes to the essay, be yourself. This is something that a major number of applicants tend to miss out on. Since so much depends on this essay, the students try and do everything possible to make this essay special. You should do nothing but be yourself. If you’re naturally funny, then do not think before projecting that in your essay. Do not take this too seriously. You can try different ways of making your essay different and better from others’. You can start your essay in the middle of a moment or you can start by telling a story. You should always remember that the admission officer is going to read a lot of other essays too. There should be something in your essay that engages him, that builds up his interest. Remember that the essay is really important. It is one of the only two places where you can tell the admission body who you exactly are (the other one being the interview). So, make the most of this opportunity. Try and write something that you cannot tell the university anywhere else in the entire application. But again, just be the way you are. Never try to pretend to have certain interests, because these admission officers are really experienced and they are wise enough to see through these lies. Tell a story, be funny and be simple. After all, the admission officers who read your essays are also people who like to laugh, get entertained and empathize. You can apply early decision to boost up your chances of getting admission in these universities. But keep in mind that you can only apply to a single school for early decision, so be careful while you choose the school to go for. Also, apply early only when you are ready to do it. Also, you should be mentally prepared to enrol if your application is accepted. If your application is accepted for admission under early decision, you must immediately withdraw from all other schools and you are then committed to attend that school. That’s where early action proves to be really better. It is not binding in nature. Moreover, the early decision/early action applications’ acceptance rates are increasing with every year. This one might seem a bit odd. But if you are a good person, it might help you in getting admission to an Ivy League university. These universities want to admit the students who, on becoming successful give it back to the society in various ways. According to an article in the NEW YORK TIMES, a student got admission in Dartmouth because he had a letter of recommendation from a custodian at his high school saying that the applicant was the only student who would help the custodian every now and then with odd jobs like cleaning the classrooms after the students had gone and switched the lights off in empty rooms. It doesn’t mean that he got the admission just because he had the letter of recommendation, but it definitely helps if you have something like this in your bag. However, it doesn’t necessarily mean that you should start doing nice things with the motive of getting admission to an Ivy League School. You should do them because you want to do them. Because in the letter mentioned above also, the custodian mentioned that the student would do all this even when no one was watching. So, be genuine and luck can turn your way.